I have Bakemonogatari and Nisemonogatari, and learned that Monogatari Series Second Season is being streamed by Aniplex, which means that Nekomonogatari would have been streamed at some point and that it would get a home release. So, I am wondering what the story's in-universe chronological order is: should I watch Bakemonogatari, Kizumonogatari (when it's released), Nekomonogatari (when it's released), Monogatari Series Second Season (when it's released) and Nisemonogatari? The first three seasons1 of Monogatari series generally takes place in the one-year period between the start of the third year of high school of Araragi Koyomi (March, Year 0) and one month after his graduation (April, Year +1). Note that it is the general trend; the stories may refer to events before the time period above. One story even takes place mostly in an alternate universe. 1 The first 3 seasons are named First Season, Second Season and Final Season. The 4th season, named Next Season, has been announced at the end of Zoku-Owarimonogatari. The details below are mostly referenced and translated from ja.Wikipedia article of Monogatari Series. † See Final Season section for more details. Ordering is based on the main events. The first number in bracket is the light novel publish order, and the second number is the anime airing order. So far, the anime generally follows the light novel publish order and the chapter order in each volume, except for Kizumonogatari and Hanamonogatari. Although the details have been kept to minimum, the titles of the chapters and the footnotes may contain spoilers. The first season takes place between March 25, Year 0 to August 14, Year 0. It generally introduces the main cast and how they get involved with the apparitions. 2 The dates are derived from the fact that May 14th, when Araragi started going out with Senjougahara, was a Sunday, and Araragi got attacked on a Friday in May which was about 2 weeks since he started dating. The Second Season takes place between August 20th, Year 0 and April 21st, Year 1. However, one can argue that the core of this season only extends up to February 1st, Year 1, since the events in Hanamonogatari is quite removed from the rest of the stories. The Second Season introduces Oshino Ougi and foreshadows her involvement behind the apparition incidents. 3 On August 21st, they time-slipped back 11 years ago, then returned to August 21st on different route, spent their time there until August 26th, then jumped back to August 21st of their original route. 4 Plus an event in late December, where Koyomi told the whole story of how Mayoi disappeared to Ougi. The period of August 21st to August 24th consists of events happening in parallel from 4 chapters, three in Second Season and one in Final Season. Araragi involved in all four of them, and he resolved one problem just to get caught up in another in the order listed. Chapters in Koyomimonogatari are all over the place in the timeline, with the earliest in April 11th, Year 0, just after the events in Koyomi Vamp/Kizumonogatari and the latest in March 13th, Year 1. However, not all chapters in the book are relevant to the core story in Final Season. The Final Season mainly takes place between August 23rd, Year 0 and March 18th, Year 1. This season mostly centers around Oshino Ougi and fills in the void left by the Second Season. Note that the time period in Final Season intersects with the period in the Second Season. 5 Plus an event on March 13th, where Koyomi told the whole incident to Ougi. This event takes place before Koyomi Dead, which is on the same day. 6 Given that these events take place in late October, and that Koyomi had been to school 5 days in a row, including the possibility of Naoetsugu High School having class on Saturday, since a different story had been set to take place in the week after, the events can only take place on either dates. 7 Since it was the second time Koyomi cleaned Kanbaru's room, the story has to take place before Karen Bee. Koyomimonogatari (暦物語) is a series of 12 short stories spaced at intervals of roughly one month; the first one occurs in April (shortly after Kizumonogatari). It remains to be seen where Owarimonogatari (終物語) and Zoku-owarimonogatari (続終物語) (not released as of this writing) will fit chronologically. The chronological order of the story progression (starting from the beginning) for the anime. 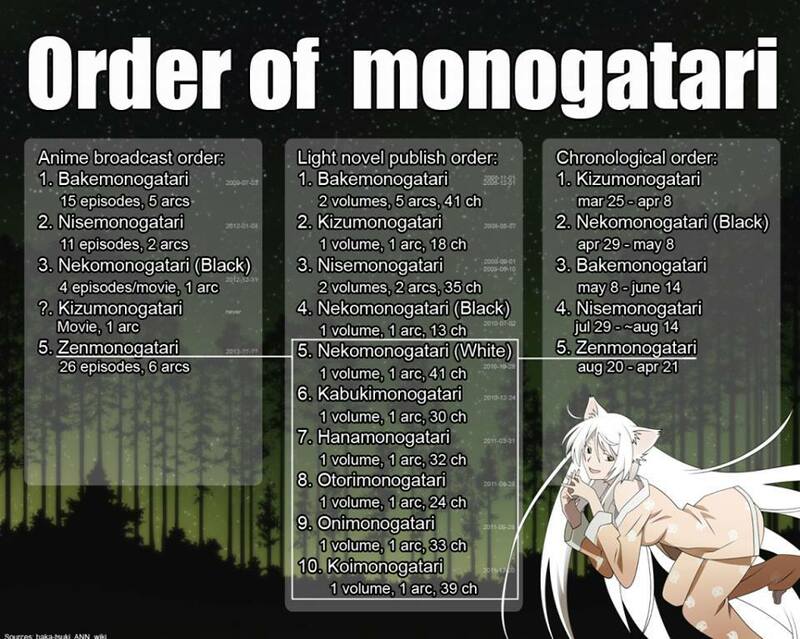 In what order should I watch Monogatari series? In what year(s) does the Monogatari series take place? Where was Araragi when he helped Tsubasa Tiger? In Monogatari, why is the boy with the reverse jagirinawa still alive? Who drew the Monogatari Series characters? Is there any connection between Madoka Magica and Monogatari series? Why does Hanekawa know about Black Hanekawa? Why the title “Second Season”? Why have they been delaying Kizumonogatari for so long?